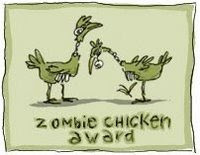 The blogger who receives this award believes in the Tao of the zombie chicken - excellence, grace and persistence in all situations, even in the midst of a zombie apocalypse. These amazing bloggers regularly produce content so remarkable that their readers would brave a raving pack of zombie chickens just to be able to read their inspiring words. As a recipient of this world-renowned award, you now have the task of passing it on to at least 5 other worthy bloggers. Do not risk the wrath of the zombie chickens by choosing unwisely or not choosing at all…"
Thanks again, greenology101!! Now I have to pass this on to five more worthy bloggers. I think there are too many wonderful bloggers out there, and I really dedicate this to all the moms out there, making healthier and greener choices for their families, and the world we all share.